Pressure ulcers are also known as pressure sores, or bed sores. They occur when the skin and underlying tissue becomes damaged. In very serious cases, the underlying muscle and bone can also be damaged. People who are unable to move some or all of their body due to illness, paralysis or advanced age often develop pressure ulcers. How common are pressure ulcers? Pressure ulcers are a widespread and often underestimated health problem. For example, in the UK, it’s estimated that between 4%-10% of all patients admitted to hospital will develop at least one pressure ulcer. For elderly people with mobility problems, the figure can be as high as 70%. Even with the best possible medical and nursing care, pressure ulcers can be difficult to prevent in particularly vulnerable people. In some cases, pressure ulcers present a minor inconvenience that can be treated with some simple nursing care. However, sometimes they can cause extensive damage to the skin, and lead to life-threatening infections, such as wide-spread infection of the blood (sepsis) and tissue death (gangrene). to treat existing pressure sores by cleaning them and by using antibiotics, improved nutrition and, in the most severe cases, surgery. The areas that are most at risk of developing pressure sores are the parts of the body that are not covered by a high level of body fat and are in direct contact with a supporting surface, such as a bed, or wheelchair. Health professionals use a grading system to describe the severity of pressure ulcers. These grades are described below. A grade one pressure ulcer is the most superficial type of ulcer. The affected area of skin appears discoloured and is red in white people, and purple, or blue, in people with darker coloured skin.In a grade one pressure ulcer, the skin remains intact, but it may hurt, or itch, and may feel either warm and spongy, or hard to the touch. In a grade two pressure ulcer, some of the outer surface of the skin (the epidermis) or the deeper layer of skin (the dermis) is damaged, leading to skin loss. The ulcer looks like an open wound, or a blister. In a grade three pressure ulcer, skin loss occurs throughout the entire thickness of the skin and the underlying tissue is also damaged. The underlying muscles and bone are not damaged. The ulcer appears as a deep cavity-like wound. 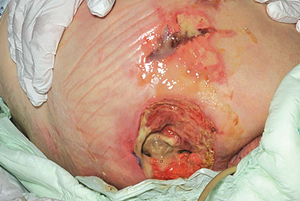 A grade four pressure ulcer is the most severe type of ulcer. The skin is severely damaged and the surrounding tissue begins to die (tissue necrosis). The underlying muscles, or bone, may also be damaged. People with grade four pressure ulcers have a high risk of developing a life-threatening infection. As pressure ulcers are a complex health problem, arising from many inter-related factors, your care may be provided by a care team made up of many different types of health professionals. This type of team is sometimes known as a multi-disciplinary team (MDT). Regularly moving your body and changing your position is one of the best ways to prevent pressure ulcers developing, and relieving pressure on grade one and grade two pressure ulcers. Once your risk assessment has been completed, your care team will draw up a ‘repositioning timetable’ which will state how often you need to be moved. For some people, this may be as often as once every 15 minutes, while others may need to be moved only once every two hours. A range of special mattresses and cushions are available that can be used to relieve pressure on vulnerable parts of the body. Your care team will discuss what types of mattresses and cushions are best for you. People who are thought to be at risk of developing pressure ulcers, or who have pre-existing grade one or two pressure ulcers usually benefit from resting on a specially designed foam mattress which relieves the pressure on their body. People with a grade three, or four, pressure ulcer will require a more sophisticated mattress, or bed system. For example, there are mattresses that can be connected to a constant flow of air, which is automatically regulated in order to reduce pressure as and when required. Specially designed dressings and bandages are available that can be used to protect pressure ulcers and speed up the healing process. alginate dressings – which are dressings that are made from seaweed and contain sodium and calcium, which are known to speed up the healing process. Topical preparations, such as cream and ointments, can be used to help speed up the healing process while also preventing further tissue damage. A type of chemical, known as oxygen-free radical scavengers, can help prevent cell damage at the genetic level. If you have a pressure ulcer, you may be given antibiotics to prevent them becoming infected by bacteria and, as a precaution, to prevent a secondary infection developing. Antiseptic cream may also be applied directly to any pressure ulcers to clear out any bacteria that may be present. Certain dietary supplements, such as protein, zinc, and vitamin C have been shown to accelerate wound healing. If your diet lacks these vitamins and minerals, your skin may become more vulnerable to the development of pressure ulcers. As a result of this, you may be referred to a dietician so that a suitable dietary plan can be drawn up for you. In some cases, it may be necessary to remove dead tissue from the ulcer in order to stimulate the healing process. This is known as debridement. If there is a small amount of dead tissue, it may be possible to remove it using specially designed dressings and paste. laser – where dead tissue is removed using focused beams of light. Maggot therapy – also known as larvae therapy – is an alternative method of debridement. Maggots are ideal for debridement because they feed on dead and infected tissue without touching healthy tissue. They also help fight infection by releasing substances that kill bacteria and stimulate the healing process. During maggot therapy, the maggots are mixed into a wound dressing and the area is then covered with gauze. After a few days, the dressing is taken off and the maggots are removed. Sometimes, it may not be possible for a grade 3, or grade 4, pressure ulcer to heal, and surgery will be required to seal the wound and prevent any further tissue damage occurring. A widely used surgical technique for the treatment of pressure ulcers is known as flap replacement (sometimes referred to as flap reconstruction). During this technique, the surgeon will use a scalpel to debride the ulcer of dead tissue. A flap of skin and muscle is then taken from another part of the body and is used to seal the site of the ulcer. Despite the high risk of complications, surgery is often a clinical necessity in order to prevent life-threatening complications of pressure ulcers developing, such as blood poisoning, or gangrene.